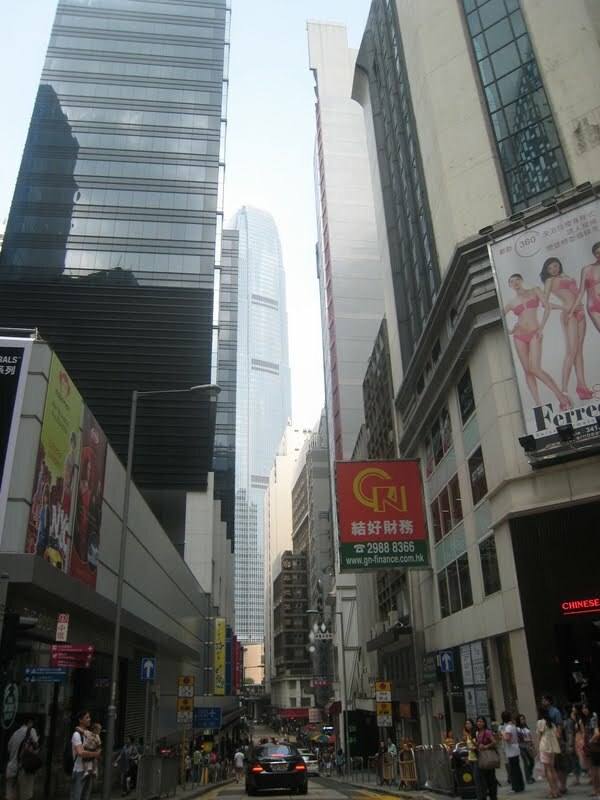 This Hong Kong walking tour takes us through Central, a district of business and luxury and walkways that span the sky. A stroll through Central feels like a jaunt into a rich and ambitious future. 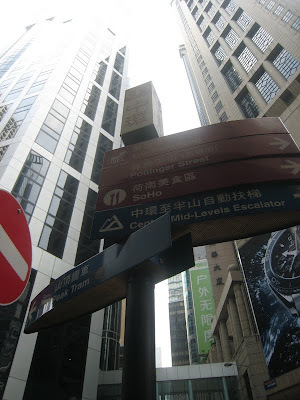 It is possible to walk from one side of Central to the other without ever touching the ground, but for this tour we'll start out on the pavement. Let's begin outside the Central Oasis, a former market that will soon be converted into something new. We are right beneath the beginning of the Mid-levels Escalator on Queens Road. Look up Queens Road for your first glimpse of the skyscrapers. Don't worry, there are maps along the road in case you get lost. 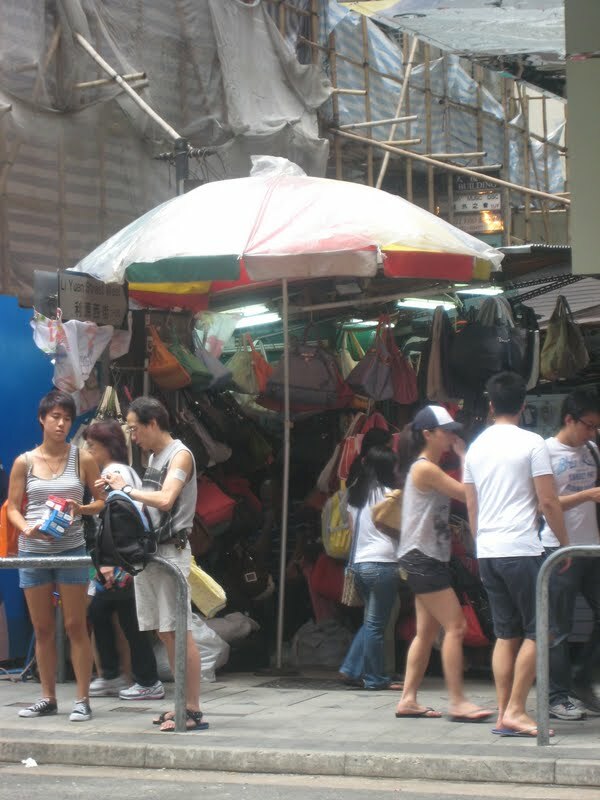 You'll start out by seeing cheap restaurants and shops full of necessities. But as you walk down Queens Road you'll start to see evidence of a more expensive commercial world. Take a peek down the road to your left. The building rising from the center is the IFC Tower, the tallest building on Hong Kong Island, shorter only than the new ICC on Kowloon side. 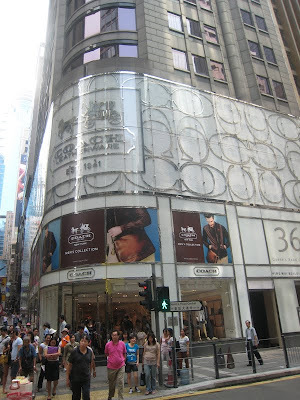 On your right you'll see Pedder Street, a steep corridor full of costume shops and miscellaneous knick-knack stalls. This is a popular spot for wedding photographs. 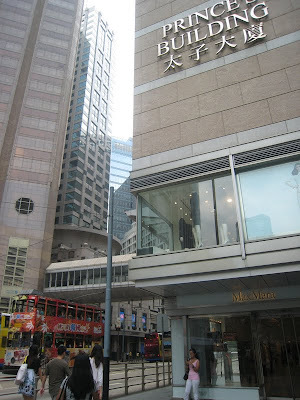 On your right you'll see the H&M (my favorite store), and other international but still affordable brands. 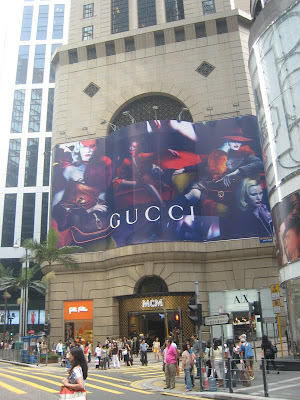 Across the street on your left you'll see the first of a group of alleys filled with stalls selling watches, handbags, sunglasses, clothes and more. Cross the street after you pass the H&M. Take another look down Queens Road as you do. Can you see the first covered walkway in the distance? You'll see the next alley, Li Yuen Street, filled with more little stalls. 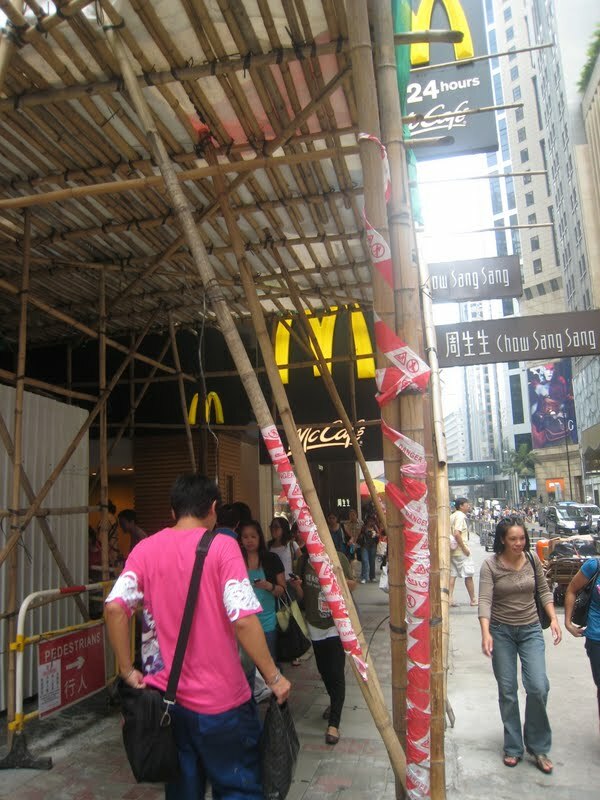 Look out for the scaffolding as you continue down the road. 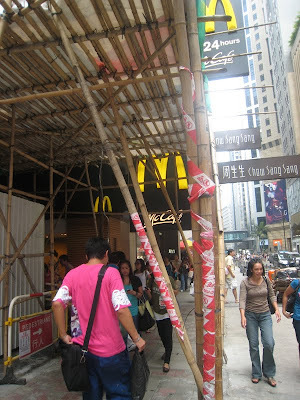 Haven't I told you before that they are always doing work around Hong Kong? 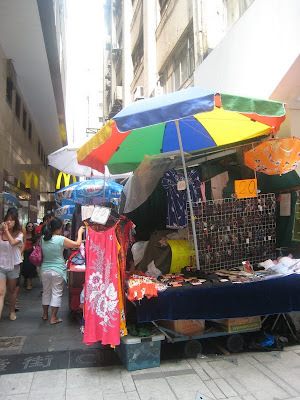 ...and the final alley full of cheap goods. You'll reach a corner where they are in the process of putting in HK's first GAP. 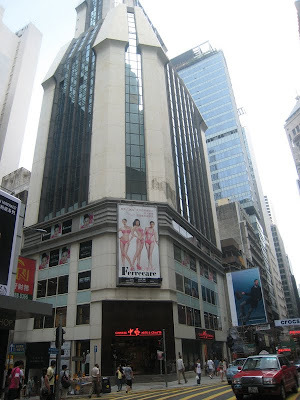 ...and in between the two is the street that leads to Lan Kwai Fong, the famous clubbing area. Keep walking down Queens Road, where you'll see more signs of wealth. 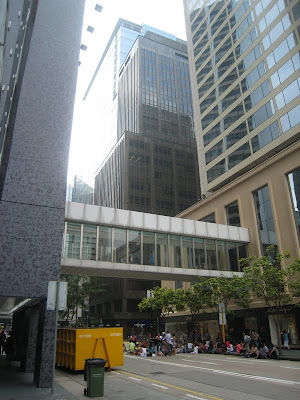 As you approach another corner, notice the covered walkway between the buildings. 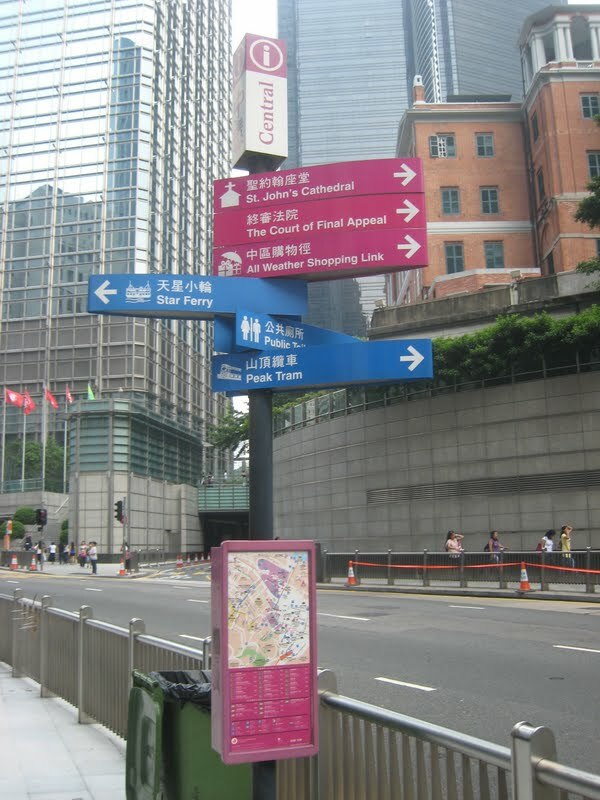 There are signs here to help you get your bearings. Down the street to your left you can see more office buildings and street-spanning walkways. Cross this street and keep going down Queens Road. 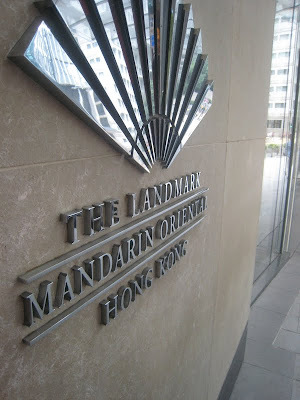 ...you'll know you've reached the Landmark Mandarin Oriental, an extension of the famous old hotel. Go back out onto the street, and continue on to Ice House Street. Cross the street, walking in the direction of the clock on the corner. To your right you'll see sudden sub-tropical vegetation rising out of the city. This is Battery Path. If you follow it up far enough you'll eventually reach the HK Zoological and Botanical Gardens in case you need a break from the steel, brick and glass. 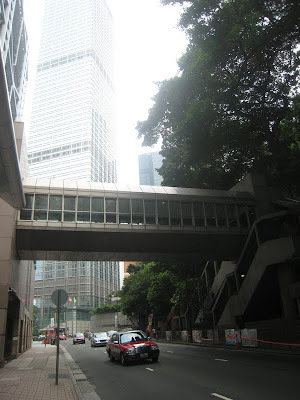 Today, however, we'll continue along Queens Road, beneath another walkway. 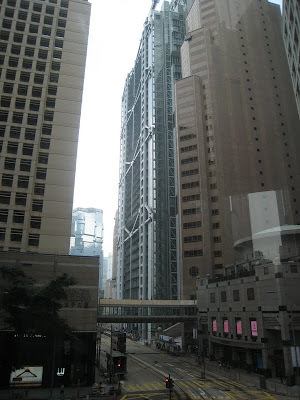 You'll be able to see the buildings of Admiralty rising up ahead. 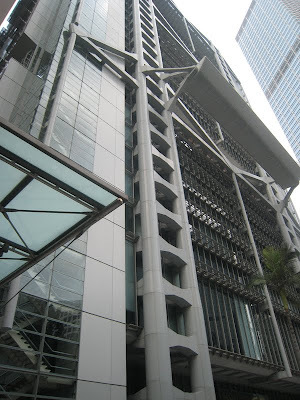 Finally, you'll reach the HSBC building, which looks like a rocket launch pad to me. There's another sign, showing all the places you can go from here. 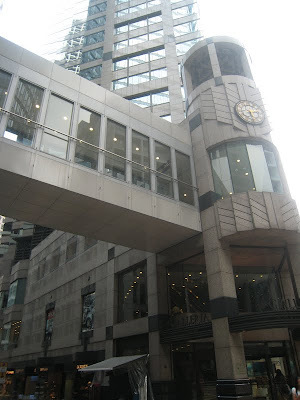 But we're heading beneath the HSBC building. Look up at the strange glass and steel interior of this distinctive building. Since I took these pictures on a Sunday, the space beneath the building is filled with hundreds of domestic helpers enjoying their day off. 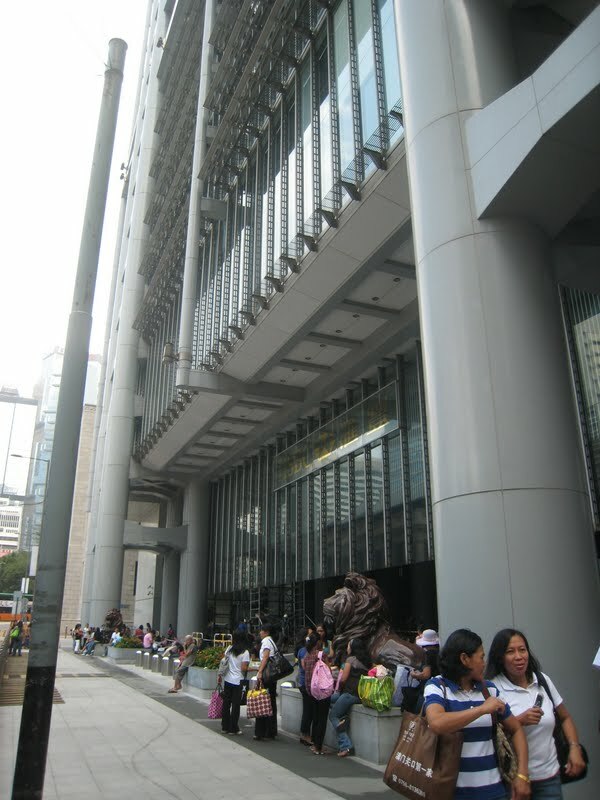 When you emerge into the sunlight on the other side of the HSBC building, you'll be greeted by one of the twin lions guarding this side. Take one final look at this side of the building. You should be able to see the second lion in the distance. 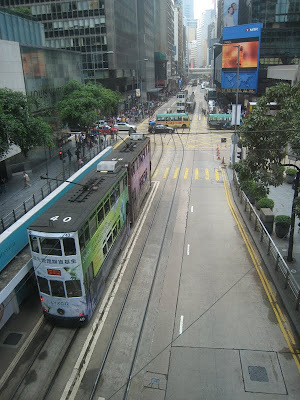 On this side you'll find the tram lines, the dome of the legislative council building, and more high-rises. 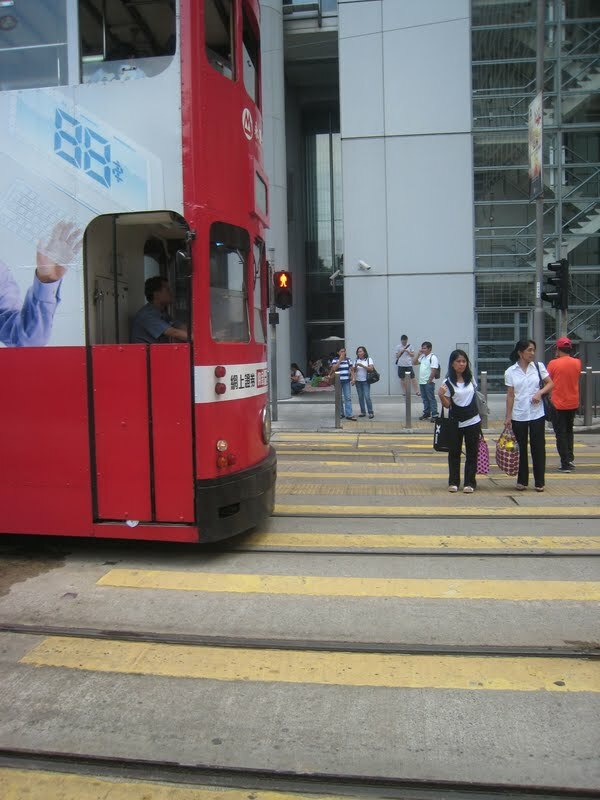 Don't get hit by the tram as you cross the street. Visit the stone colonnades of the legislative council building. It should look familiar. There's a park with fountains and picnickers on this side. Walk to the corner of Prince's Building at the edge of the park. Then follow the side of the building to the other edge of the park. You'll see the original Mandarin Oriental. Turn left and walk down Chater Road. You'll see more covered walkways. I think it's about time to explore them. On the opposite side of the road you'll see St. George's Building and Jardine House. 10 points if you know Jardine House's nickname. If you're anything like me, you won't be able to afford to shop in this part of town. At this point you are walking parallel to Queens Road, back in the direction you came from, so you'll cross Ice House Street again. Every once in a while you'll see an entrance to the MTR. Central station fills much of the space beneath these buildings. 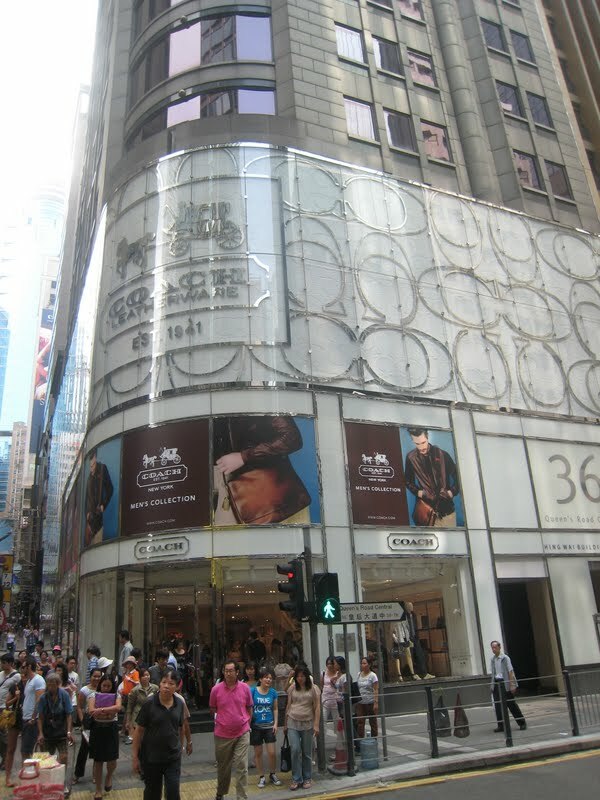 Cross the street to Chater House. 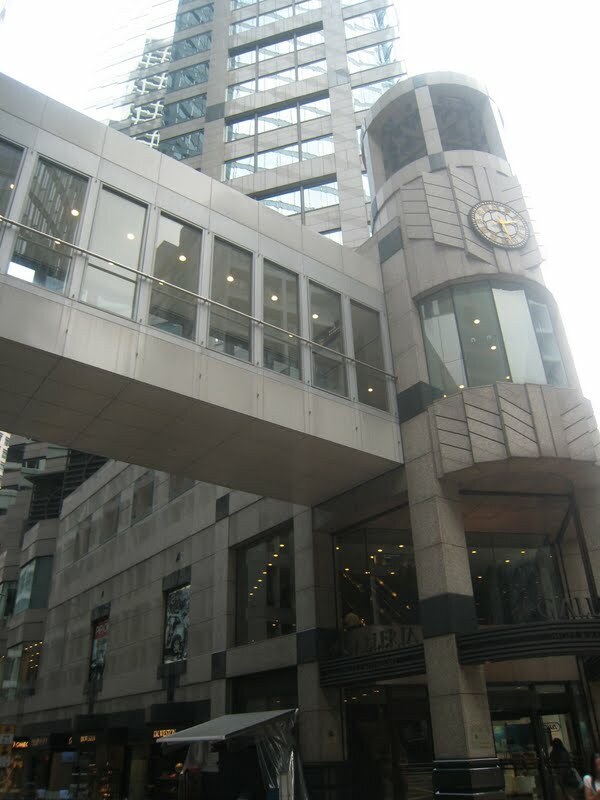 It's time to enter the labyrinth of walkways that make up Central. 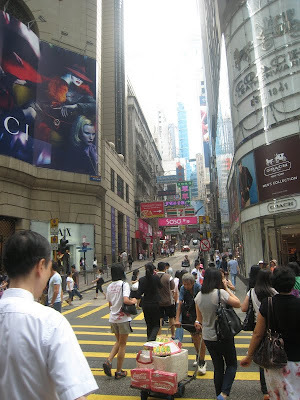 Take the escalator straight up from the street. 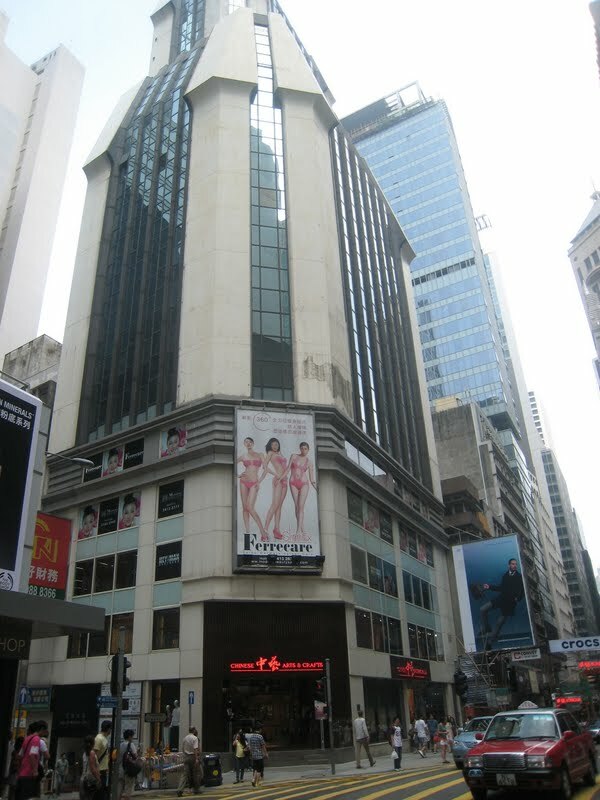 Chater House is also known as the Armani building. 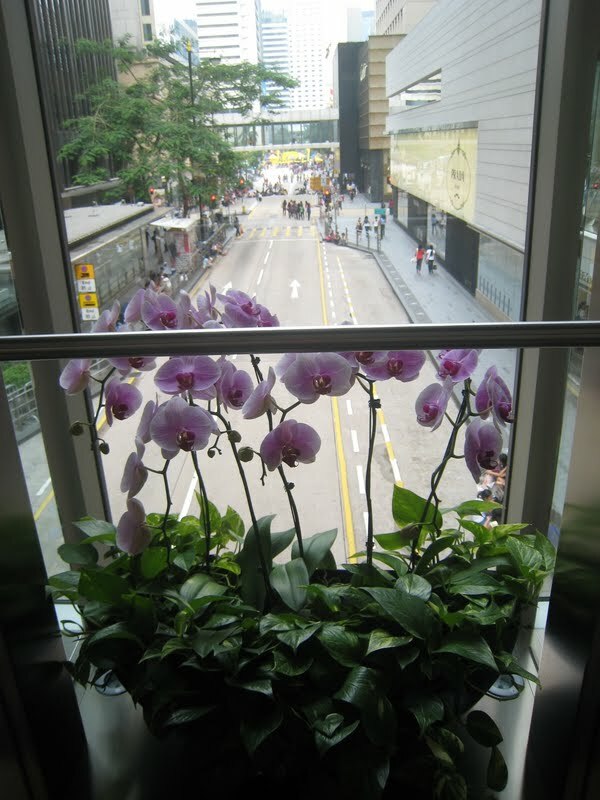 It has every type of Armani store imaginable, even Armani flowers. This is what many of the Central buildings look like inside: office towers whose bottom levels are full of luxury stores. Enter your first walkway on the left. Take a look at the street below. This walkway takes you through Alexandra House. Walk around the corner and take the next walkway on your right. You'll be able to see the tram lines on Des Veoux road from here. Looking back you can see the Armani building. Now you're entering the Landmark, which we saw back on Queens Road. This is what it looks like inside. 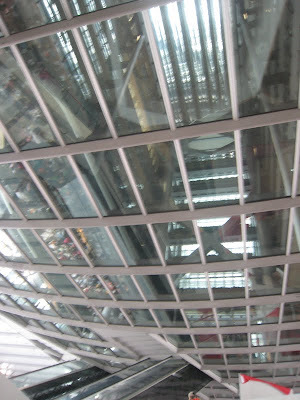 On more than one occasion I've seen runway shows taking place in the space below. One was a Paul Smith show, if I remember correctly. There's even a place to sit and have Sunday lunch. 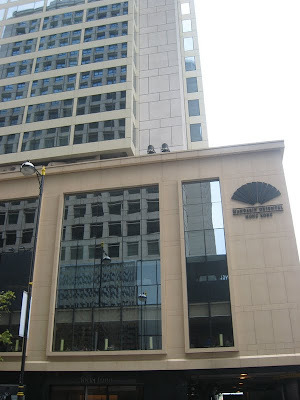 Walk along the left edge of the building and then take the walkway on your left. 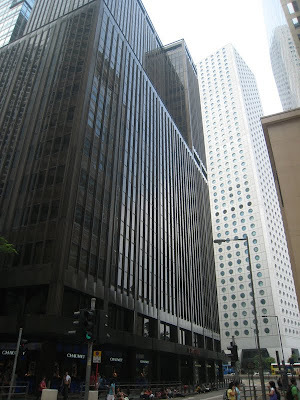 You can see the HSBC building from this one. This will take you back into Alexanra House. ...and finish up the tour with an overpriced cup of iced coffee. I hope you've enjoyed another Hong Kong walking tour. Come back next week to see another side of this singular city. Don't forget to enter my 100 FOLLOWER GIVEAWAY by September 12th if you haven't already! So much to see and do!! I'm impressed you didn't get lost more than once lol it all seems like so much! 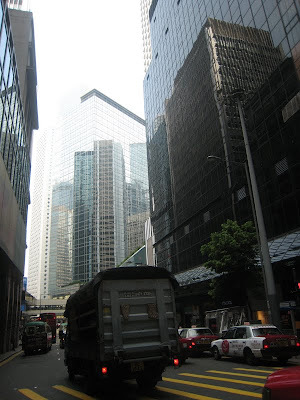 Absolutely brilliantly put together, I really enjoyed all of your tours of HK and cannot wait to see more.